This chapter uses cognitive theory of information processing to demonstrate the role of visual learning in the context of reading and writing. According to the theory, individuals do not take a singular approach to processing information. Rather, they experience the world through visual and verbal channels. Information is then organized by working memory into more comprehensive models—the visuo-spatial sketchpad and the phonological loop. 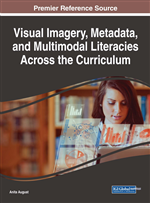 The author considers pedagogical strategies for writing instruction that rely on the multimedia principle, which states that our minds work best when learning combines the visual with the aural. The specific mission of the chapter is to show how the multimedia principle can benefit writing instruction in three different contexts: 1) reading and writing comprehension, 2) narrative writing, and 3) grammar usage. The chapter concludes with the suggestion that learning through images is not just a cultural phenomenon, but also a scientific one. Cognitive scientists have been researching the effects visual learning has on our minds for more than fifty years. Grounded in empirical work, these researchers have constructed frameworks and theories that help explain how visual and verbal presentations are responsible for structuring the mental schema that learners form to make sense of the world. For the present chapter, a useful starting point is Paivio’s (1991) review of the foundational claims that imagery is a powerful boon to cognition and memory.